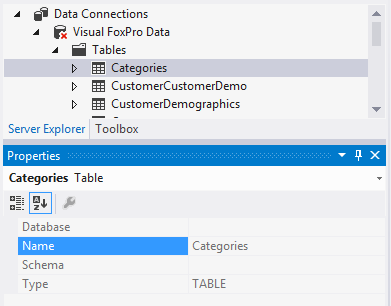 In one of the earlier versions of the Visual FoxPro Entity Framework Provider I ran into a nasty performance problem when generating the schema information for the Entity Framework Designer. The process that was used to get the schema information involved using the connection’s GetSchema method and then dumping that into a VFP table – for re-querying later. In my first attempt I was creating the tables and then inserting each record. What I found was inserting each record was very time consuming. I later realized that I could pass all the data to VFP as xml and convert that to a cursor so that the cursor could be used for inserting the data. This made a huge difference in performance. This blog entry shows how you can do a bulk insert. 1:  // Get the Northwind OrderDetails data. 4:  // Convert the DataTable to an XmlToCursor formatted xml string. 5:  // ToXmlToCursorFormattedXml is an DataTable extension method in the VfpClient namespace. 11:      // Create cursor using XmlToCursor with the DataTable xml. 20:      // Use the cursor to insert records into the destination table. 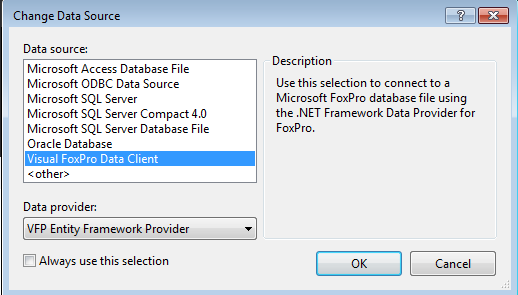 One thing that has always annoyed me is the way passing parameters in a sql statement work when working with Visual FoxPro data from .Net using OleDbCommand. Use of question marks place holders instead of named parameters. Need to add parameters to the command in the order that they appear in the sql statement. Need to add a parameter for each question make place holder even if a parameter has already been added with the same value. In this example of the problem, I have a simple query that spans multiple tables looking for records that match a name or id. Ideally such a query would only require two parameters to be added to the command. But as you can see there were 12 parameters added to satisfy the ordinal place holder requirements. Admittedly, adding multiple parameters with the same values isn’t a huge problem nor is making sure the question marks line up with the correct parameter value. But I do find that dealing with this annoying mundane task causes a pause in my development as I try to work things out mentally. 6:      FROM Suppliers WHERE UPPER(ALLTRIM(CompanyName)) like ? OR SupplierId = ? 8:      FROM Shippers WHERE UPPER(ALLTRIM(CompanyName)) like ? OR ShipperId = ? 10:      FROM Customers WHERE UPPER(ALLTRIM(CompanyName)) like ? 12:      FROM Products WHERE UPPER(ALLTRIM(ProductName)) like ? OR ProductId = ? 14:      FROM Categories WHERE UPPER(ALLTRIM(CategoryName)) like ? OR CategoryId = ? 16:      FROM Employees WHERE UPPER(ALLTRIM(FirstName)) like ? OR UPPER(ALLTRIM(LastName)) like ? OR EmployeeId = ? Switching from using OleDbCommand to using VfpCommand (found in VfpClient) will allow you to use named parameters. * I personally find the example using VfpCommand much easier to understand and work with compared to the example using OleDbCommand. One thing that has always annoyed me when working with the OleDbDataReader is that it is very exact. 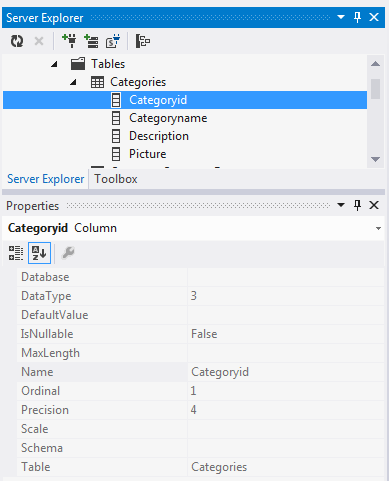 It expects that you know how the database types should be converted to .Net types and doesn’t allow for any flexibility (well not counting using GetValue with an explicit convert). This usually surfaces as a problem for me when trying to read a n(x, 0) field into .Net. 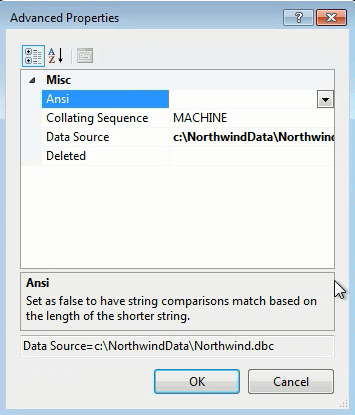 My first instinct is to call GetInt32 on the data reader but that results in an error that reminds me that .Net sees this type of field as a decimal. 10:          // Result type is Decimal. 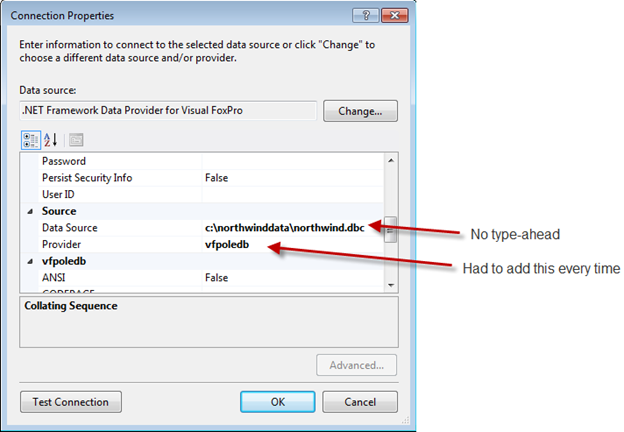 15:              // The OleDbDataReader will not let me retrieve the value as an integer. 24:          // Result type is Decimal. As you can see, the OleDbDataReader won’t give me the type that I want using GetInt32. To get the value as an integer I would have to use GetDecimal or GetValue and then manually convert that value to an integer. Personally, I’d rather the data reader handle this conversion for me. When using the OleDbReader to read character field values you tend to end up with trailing spaces in your string variable. I find this rather annoying because I consider those trailing spaces to be nothing more than a database storage detail. So I modified the GetString method so that it includes a call to TrimEnd before returning the string value. Another change made to the GetString method is to do an Automatic Type Conversion for VFP fields that are created with “NOCPTRANS” (binary character, binary varchar, and binary memo fields). The OleDbDataReader will return these fields as a byte array. I would rather access these types as strings. The OleDbDataReader just doesn’t get it right when it comes to identifying primary keys and auto incrementing columns. 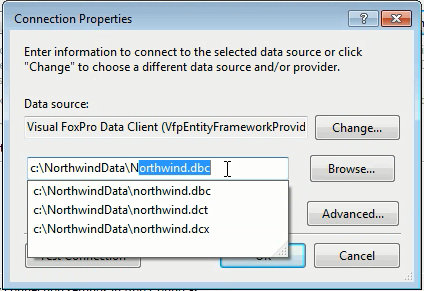 I’ll use the Northwind Customers and Orders tables to prove this point and show how the VfpDataReader fixes this issue. Here is an example comparing the data reader schema for the Customers table. Here is the VFP structure to show that the IsKey should indeed be true. Here is an example comparing the data reader schema for the Orders table. In this example, not only did the OleDbDataReader not get the IsKey right… it also failed on getting the correct IsAutoIncrement value. Here is the VFP structure to show that the IsAutoIncrement should indeed be true. Add the VfpClient diagnostics source for tracing command text. VfpClient uses the VfpOleDb provider so the VfpOleDb installer is included in the NuGet package in case you don’t already have it installed. Additionally, the NuGet package includes an installer for VfpClient. 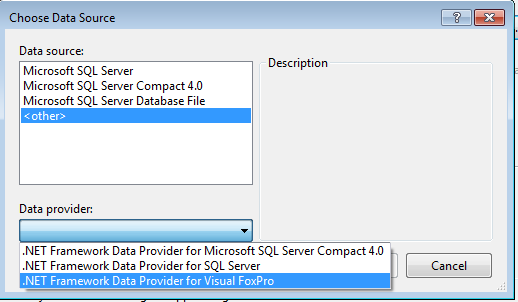 This installer will install the VfpOleDb provider and modify system settings to setup Visual Studio Integration with VfpClient. 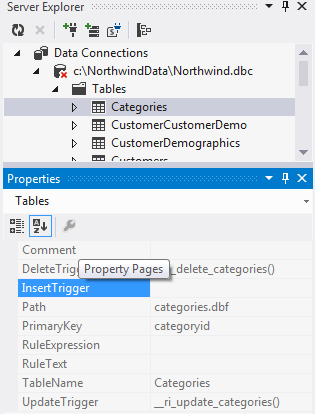 The Visual Studio Integration includes some minor changes to simplify the connection process and changed property pages to include VFP specific information. Here is a view of some of the screens. The old screen is on the left the new is on the right. Added the "Visual FoxPro Data Client" data source so that you didn’t have to dig through the "<other>" selection. Simplified the Connection Properties so that you just need to specify a path. 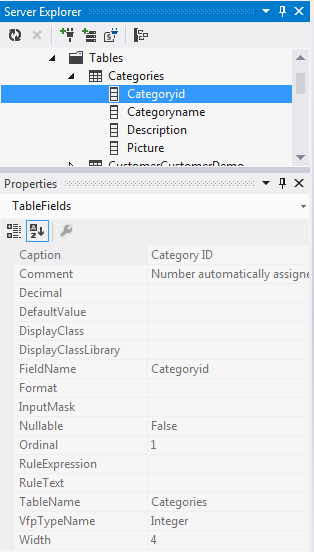 The Schema properties for Table, Fields, Views, and Stored Procedures are VPF specific values (using DBGETPROP). It has been awhile since I blogged about an update to the VFP Entity Framework Provider. Here is a list of changes since my last post (which was for v0.6.1). (v0.6.2) – Modified the schema retrieval code to treat a free table candidate key as a primary key. (v0.6.2) – Fixed bug related to using character field as a primary key. (v0.6.3) – Added support for binary char, binary varchar, binary memo, date, and Guid. (v0.6.3) – Fixed issue with Inserting/Updating DateTime values. (v0.6.4) – Changed how columns are aliased in a query. (v0.6.5) – Changed the way Decimal, Double, and Single values are written as part of DML commands to deal with localization issues. (v0.6.5) – Made various changes to shorten the SQL command text length to help prevent "VFP Error 1812 – Statement too long" errors. (v0.6.6) – Modified the SELECT statement to include a CAST(<fieldname> AS N(20, <scale>)) for Numeric values that include a decimal. To address this type of issue. (v0.6.7) – Changed how Single, Double, Decimal, and DateTime constants are written out for the sql statements. (v0.6.8) – Changed data manipulation statements to parameterize some types to fix localization issues and to prevent invalid statements due to carriage returns in strings. (v0.6.9) – Modified installer to include setup for VS2012. (v0.7.0) – Refactored ADO.Net related code to use VfpClient. There have been several updates along the way which really didn’t warrant a blog post which I why I haven’t written one. This release isn’t much different as far as blog worthy content. However, there were a few minor design time changes that should make things a little nicer (at least that is what I think) so I’ll go ahead and point them out. Before digging into the changes I’d like to mention the refactoring effort that was made for this release. 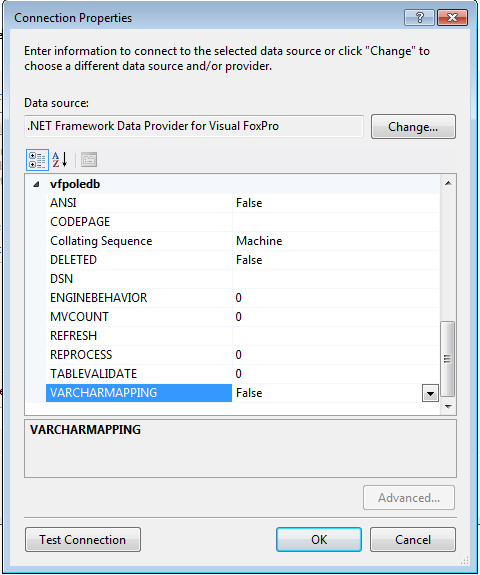 The VFP Entity Framework Provider was originally developed using the System.Data.OleDb. * classes to connect to the VFP data – which is probably what you’d expect. These classes required wrapper classes to handle some Entity Framework expectations. What expectations? Well lets just state the obvious which is the Entity Framework was original targeted for SQL Server. So what does that mean as far as expectations? In short I would say that if the System.Data.SqlClient. * classes “do it”… then the classes that the VFP Entity Framework Provider uses needs to “do it” too. One good example would be that the SqlCommand class uses named parameters. So the SqlCommand equivalent that VFP Entity Framework Provider uses must support named parameters. In this case I needed to create a wrapper class around the OleDbCommand that could handle the concept of named parameters. Doing this in the VFP Entity Framework project was actually the second time that I needed to write this wrapper class. The first time was in the LINQ to VFP project. Needless to say that having similar code in two different projects just didn’t seem right. So I decided to pull the OleDb wrapper classes from both projects and place them in a new project. VfpClient is the new project that was created with the wrapper classes but the development didn’t end there. I also pulled in the Sedna DDEXProvider project (Microsoft.Data.FoxClient) which started me down the path of customizing the design time experience. So coming back from what must seem like a tangent… the VFP Entity Framework Provider was refactored to use VfpClient which includes a couple design time changes. Even though this isn’t my first blog post for the provider I thought that it would be nice to take a step back and show how to install the provider. I also thought it would be nice to show an example of it in use so that I can point to this post as a “Getting Started with” post since a couple screens have changed. To install the provider you just need to download and run the VfpEntityFrameworkProvider.msi from http://vfpefprovider.codeplex.com/. Here is a quick video showing the provider in use.